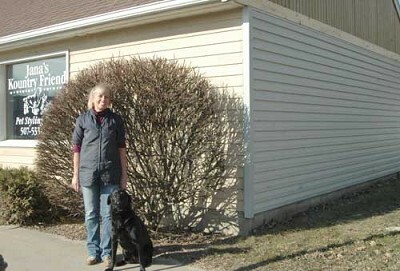 Jana Groski, owner of Kountry Friends, a Stewartville pet care business, poses with her black Lab, Marley, near the store at 301 North Main St. The city of Stewartville�s EDA, at a recent meeting, unanimously agreed to pay half the total project cost or new siding for the Kountry Friends building. Randy and Sue Lindquist, owners of the building, applied for the grant from the EDA. The Economic Development Authority has helped a local business spruce up the looks of its property along Main Street. For more on this story pick up your copy of the April 2 Stewartville STAR.